The excitement accompanying the November appearance of the Banana Pi router (BPi-R1) was considerable. Finally, new hardware promised more than just additional core, storage, and peripherals. The concept behind the BPi-R1  was to offer a combination device that works as a router and provides additional services as a server. Several manufacturers have offered devices that perform services for the local network, typically with at least one USB port for external peripherals. However, reality often lags far behind marketing promises: Services are badly implemented with old and error-prone software or they hobble along with lame hardware; regular updates are the stuff of unfulfilled wishes; and some manufacturers delay fixing outrageous security defects – if they fix them at all. Although courageous users can install alternative firmware with OpenWrt or DD-WRT, they run the risk of bricking the device and thus rendering it permanently unusable. Successful firmware installation in no way guarantees that the router will work smoothly and efficiently, especially if no open source drivers exist for the components used. The open system of the R1 should close these gaps. The first impression made by the BPi-R1 is that it has been hastily cobbled together. 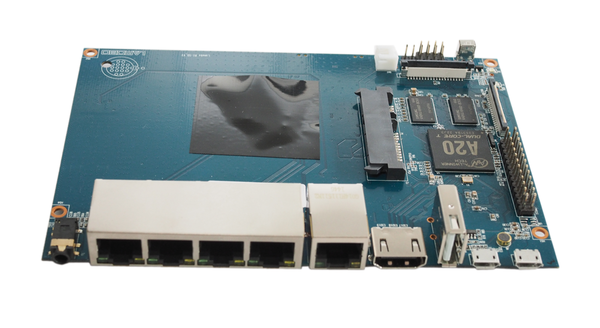 One side of the board comes from the standard Banana Pi and includes the A20 dual-core ARM Cortex-A7, a Mali400 GPU, 1GB of RAM, HDMI and audio connections, microphone and IR ports, and two very fragile buttons (Figure 1). The user is justified in asking what purpose all of these components serve on a server or router board. Figure 1: The A20 chip is on the right side of the BPi-R1. The router takes microSD instead of standard SD cards, as on the current version of the Raspberry Pi. Unlike the original Banana Pi, the R1 has forfeited one USB port and instead has a ready-made SATA connection on the top side. In comparison, the Banana Pi had two connections for power and data and needed a special cable to connect a hard drive. The SATA port is the most questionable of the connections on the router, with no mechanism for attaching a disk. Instead, when the router sits level on a surface, an attached disk would sit on top of the board, which possibly could lead to heat buildup by the switch chip. When operating the board in a vertical position, the weight of the disk would tug at the SATA connector. Luckily, the electronic elements on the board of the newer routers are protected by a piece of foil, but this fix could potentially cause overheating problems. The power supply connects via a micro-USB port, but with a micro-USB OTG connection located directly alongside, confusion between the two is pretty much a foregone conclusion. For stripped down functioning, a stable power supply with 5V and 1A of current suffices, but when the network interfaces and the SATA disk experience heavy loads, expect to need a 5V, 2.5A power supply. The router does not come with a case or an antenna; however, ready-made antennas with a suitable cable generally don't cost much. Although a router case is on the market, according to reports, it causes problems by trapping heat . Four mounting holes should let you put the board in a case of your choice. The cost for all of the components and delivery is about $110 with free shipping. The most important parts of the R1 are the new network components. 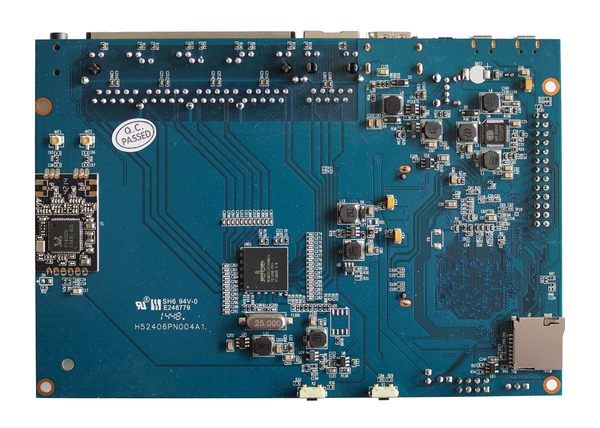 One of these parts is the RTL8192CU WiFi chip from Realtek which supports 802.11b/g/n. The underside of the board has two antenna connections for this chip (Figure 2). A focal point of the R1 is the BCM53125 switch chip with its nine ports. This is a Broadcom chip per the IEEE 802.3az standard. One of the ports is used by the CPU, and five of the remaining eight ports are externally available via RJ45 connectors. Figure 2: The WiFi chip is to the left and the switch chip is in the middle on the underside of the board. The routing for a second physical network connection occurs in software over virtual LANs (VLANs). Switching is accomplished by the chip without causing a noticeable burden on the CPU. Therefore, a corresponding configuration will give you a five-port switch, in which any of the ports can serve as the uplink port. The R1 hardware offers a variety of possibilities when configuring a network, ranging from the creation of a dumb switch to a router that can handle two or even three networks, depending on whether you configure the WiFi as an independent network. The BPi-R1 lends itself very well for use in learning the ropes of network technology. Contrary to off-the-shelf devices that come with OpenWrt, the risks for the beginner are limited. The operating system on the microSDHC card is easily accessible, so an incorrect network configuration won't cause the system to keel over.